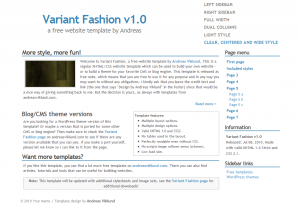 I’m starting off with a fresh copy of the Variant Fashion template (direct download link: variant-fashion.zip), and I want to make the index.html file (which is dark, narrow and left-aligned) look like the clear.html file (which is light, wider and centered). The first thing to do is to look at the HTML code and find the <body> tag. It should be on line #12 if you view the code in a regular code editor. This will be the first line to edit. If you look at the CSS file, you will see that it defines the primary layout in the way I typically do in my templates. Tags, ID:s and classes are defined and sorted into a few different parts of the stylesheet. But further down in the CSS file there are two non-standard sections of CSS code, with a number of lines starting with body.lightstyle and body.clearstyle. These two sections re-define some of the ID:s and classes, and they are triggered by applying a class attribute to the body tag. 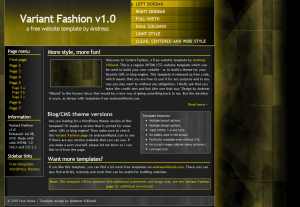 The first section is the light style that can be seen in light.html. The second is the clear style that I want to use on index.html. Then save the file and view it in a web browser. The dark look should now have been replaced with the clear style. The look is dramatically different, but the basic layout is the same except that it is now centered and wider. If you prefer to have the sidebar on the left side, then this is the only change that needs to be done. But clear.html has the sidebar to the right, so one more change is needed. These two look quite similar to eachother, with one significant difference: #sidebar uses float:left while #sidebaralt uses float:right. The float decides the positioning of the sidebar in relation to the main content section. By using this kind of modifier through a body class, it is possible to make layout and design modifications while still keeping the default design and layout intact. This can be done on any of the templates, as I will show in a future “how to”-post. It can be really useful if you want the front page of your template-based website to have one layout, while subpages have a slightly different layout. It can also be used to give each page on a website its own accent color – for example by having red links on a page about one topic and blue links on another page about another topic. In this example, all links are blue and bold by default. On pages which have <body class=”redlinks”>, links will be red – but the font-weight for the links will remain bold since it is not modified by the body class CSS. The same concept can be used for any changes you want to do, such as aligning images or defining content area widths jus to give a few examples. I will write more about this and publish more templates that use body classes later this week, so if there is something specific you would want to know – post a comment to this entry and I’ll follow it up in upcoming posts! Is it template for wordpress? Hi, I downloaded this Variant Fashion. I ran into problems immediately. Text won’t show nordic alphabets such as ä and ö. Can the code be changed? Or how can I change it for me?